 Vagnsset med 3 containervagnar Lgs typ NSB "DB Schenker"
Vagnsset med 3 containervagnar Lgs typ NSB "DB Schenker"
Denna produkt ger dig 1257 bonuspoäng. Vagnsset med 3 containervagnar Lgs typ NSB 'DB Schenker', totallängd över buffertar 51,2 cm, epok VI. 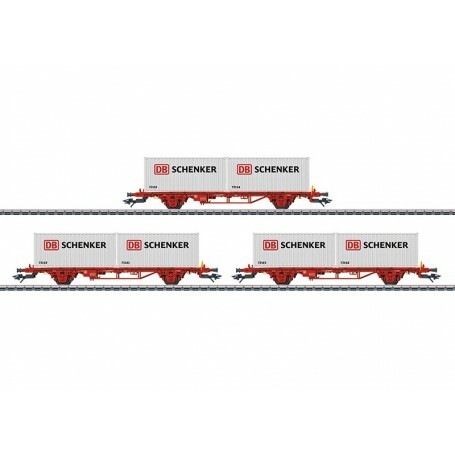 Type Lgs Container Transport Car Set	Model: The cars have partially open flat car floor constructed of metal. The car frames have truss rods. The cars have separately applied destination boards. Each car is loaded with two 20-foot box containers. The containers are removable. All of the containers and flat cars have different registration / car numbers. Total length over the buffers 51.2 cm / 20-1/8'. DC wheel set E700580. Prototype: 3 Norwegian State Railways (NSB) type Lgs two-axle container transport cars. Each loaded with two 'DB Schenker' 20-foot box containers. The cars look as they currently do in 2016. The class 185.6 electric locomotive goes with this car set and can be found under item number 36633 in the Märklin H0 assortment.